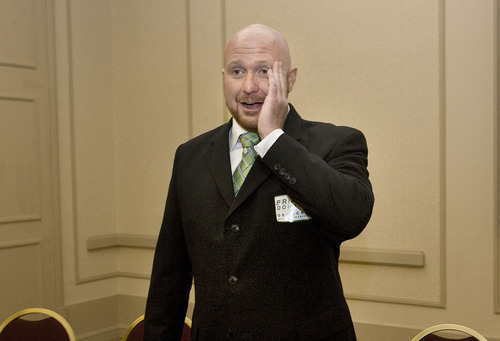 State party elects Utah Pride Center co-founder, first openly gay leader. Scott Sommerdorf | The Salt Lake Tribune Congressman Jim Matheson, D, Utah, endorses Jim Dabakis, right, for the seat as Democra Scott Sommerdorf | The Salt Lake Tribune Congressman Jim Matheson does a television interview in the hallway at the Democratic c Scott Sommerdorf | The Salt Lake Tribune Candidate for Democratic Party chairman Jim Debakis speaks. Scott Sommerdorf | The Salt Lake Tribune Retiring representative for District 30 Jackie Biskupski reaches to congratulate her re Scott Sommerdorf | The Salt Lake Tribune Brian Doughty reacts with shock as the vote tally shows he's the newly elected represen Scott Sommerdorf | The Salt Lake Tribune Newly elected representative for District 30 Brian Doughty, right, stands with his part Scott Sommerdorf | The Salt Lake Tribune Jim Dabakis, candidate for Utah Democratic party chairman, center, speaks with the Syra Scott Sommerdorf | The Salt Lake Tribune Salt Lake County District Attorney Sim Gill, left, speaks with Salt Lake Mayor Ralph Be Scott Sommerdorf | The Salt Lake Tribune Utah Senator Luz Robles, D,-Salt Lake City, speaks with supporters. Scott Sommerdorf | The Salt Lake Tribune Rep. David Litvack, D-Salt Lake City, speaks about how indebted he and the other House Scott Sommerdorf | The Salt Lake Tribune Brian Doughty turns to hug his partner, Rian Davis, right, on Saturday after having bee Scott Sommerdorf | The Salt Lake Tribune Hawaii Gov. Neil Abercrombie speaks to the delegates at the Utah Democratic convention. 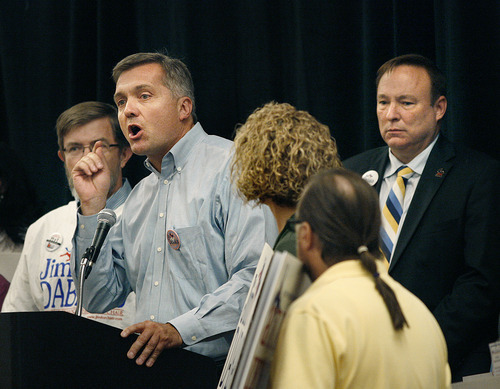 Scott Sommerdorf | The Salt Lake Tribune Congressman Jim Matheson, D, Utah, endorses Jim Dabakis, right, for the seat as Democratic Party chair. 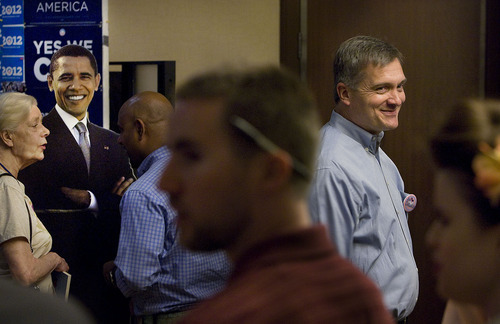 Scott Sommerdorf | The Salt Lake Tribune Congressman Jim Matheson does a television interview in the hallway at the Democratic convention at the Hilton Hotel on Saturday as a cardboard cutout of President Barack Obama smiles in the background. Scott Sommerdorf | The Salt Lake Tribune Candidate for Democratic Party chairman Jim Debakis speaks. Scott Sommerdorf | The Salt Lake Tribune Retiring representative for District 30 Jackie Biskupski reaches to congratulate her replacement, Brian Doughty. Scott Sommerdorf | The Salt Lake Tribune Brian Doughty reacts with shock as the vote tally shows he's the newly elected representative for District 30, replacing Jackie Biskupski. Scott Sommerdorf | The Salt Lake Tribune Newly elected representative for District 30 Brian Doughty, right, stands with his partner, Rian Davis after the announcement of his one-vote win. 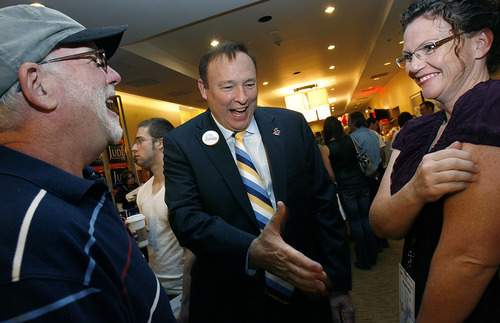 Scott Sommerdorf | The Salt Lake Tribune Jim Dabakis, candidate for Utah Democratic party chairman, center, speaks with the Syracuse Mayor Jamie Nagle, right, and Bing Kerwood at the Democratic convention at the Hilton Hotel in downtown Salt Lake City on Saturday. 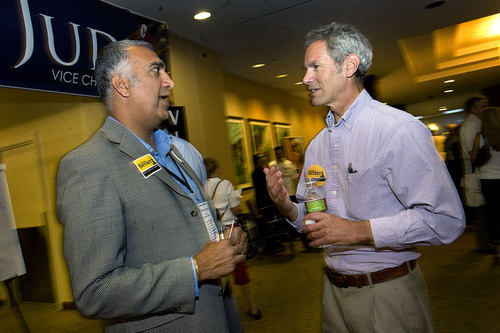 Scott Sommerdorf | The Salt Lake Tribune Salt Lake County District Attorney Sim Gill, left, speaks with Salt Lake Mayor Ralph Becker in a hallway at the Democratic convention. 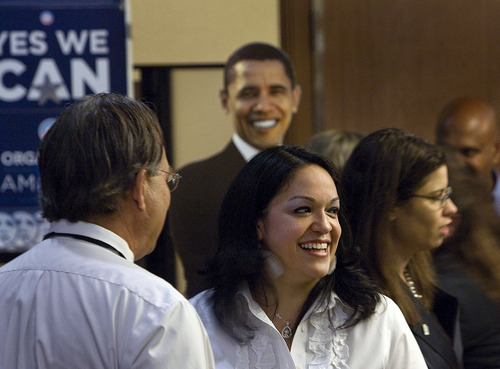 Scott Sommerdorf | The Salt Lake Tribune Utah Senator Luz Robles, D,-Salt Lake City, speaks with supporters. 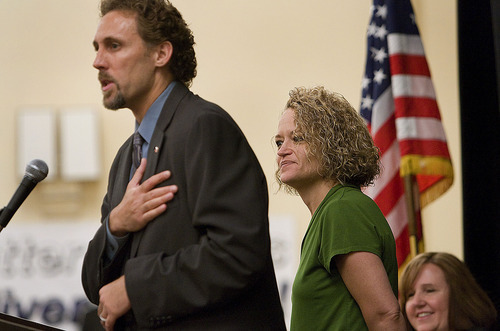 Scott Sommerdorf | The Salt Lake Tribune Rep. David Litvack, D-Salt Lake City, speaks about how indebted he and the other House Democrats are to retiring Rep. Jackie Biskupski, right. Scott Sommerdorf | The Salt Lake Tribune Brian Doughty turns to hug his partner, Rian Davis, right, on Saturday after having been announced as the winner in the District 30 race for Jackie Biskupski's House seat. Rep. Brian S. King, D-Salt Lake, is at far right. Scott Sommerdorf | The Salt Lake Tribune Hawaii Gov. 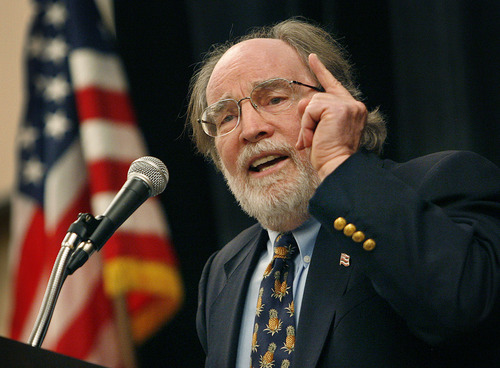 Neil Abercrombie speaks to the delegates at the Utah Democratic convention. 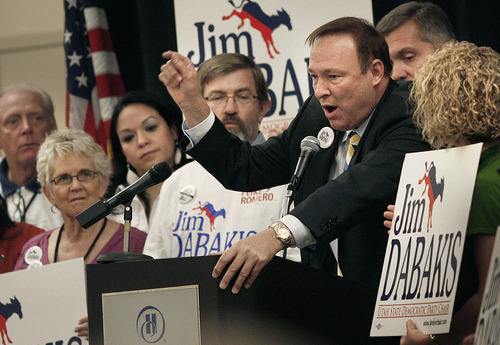 Utah Democrats made history Saturday afternoon, electing Jim Dabakis as state party chairman by a wide margin. 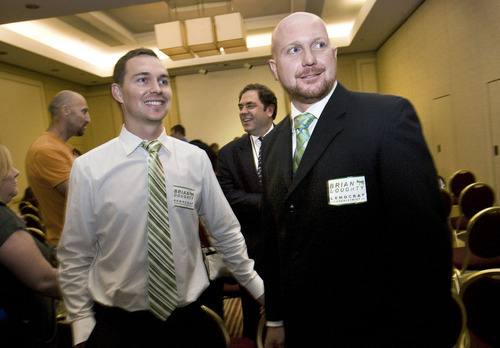 He is believed to be the state's first openly gay major party leader. In a much closer race, delegates at the Democratic State Convention elected small-business owner Brian Doughty, who is also openly gay, to fill the Salt Lake City House seat vacated by former Rep. Jackie Biskupski. Dabakis, who is an art dealer and co-founder of both the Utah Pride Center and Equality Utah, said his election shows how fair-minded the people of Utah are. "I visited all 29 counties during the last five months, and people were very interested in what kind of a job I would do and what my experience was," Dabakis said. "The whole gay thing just simply did not surface as an issue. People are broad-minded in Utah, and they want to know if you can do the job or not." He said that, as party chairman, his priority will be to win races for Democrats across the state. "Our state is facing an important moment here, especially with the Republican Party now splintering between the tea party and the more moderates. We need to convince people all across the state that the Democratic Party is the solution." He also said he hopes to work to let independents, Republicans and Latter-day Saints know they're welcome in the Democratic Party. "I want to talk to LDS people and I want to tell them that we want them in our party, we need them in our party," Dabakis said. "We recognize that they have a great deal to contribute. ... As chair, my commitment is to make sure that LDS people feel comfortable in our Democrat tent. Sometimes, we haven't been as warm and as inviting as we should be." Dabakis beat Robert Comstock, a political activist and middle-school woodshop teacher, by 528 to 71. He replaces outgoing state Chairman Wayne Holland Jr.
By contrast, it was a narrow victory for Doughty in an election where many had expected Nikki Boyer, president of the board of the Utah Pride Center, to win. Six candidates vied for Biskupski's seat, but none of them received the required 60 percent of delegate votes in the first round. A second round of voting between the top two vote-getters, Doughty and William McDonnell, director of the University of Utah's Center for Children's Environmental Health Law and Policy, then took place. Boyer announced before that second round that she'd like her supporters to vote for Doughty, who then beat McDonnell by one vote. 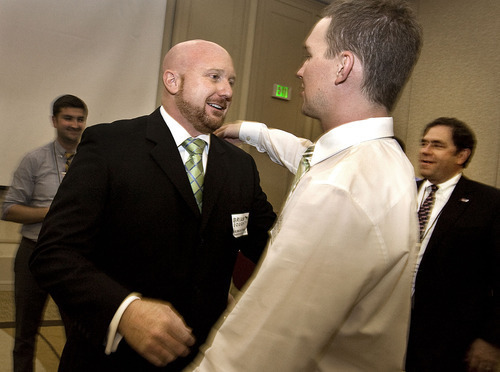 Doughty's win means the Utah Legislature will also continue to have at least one voice from the gay community. Biskupski, who resigned recently because she moved out of her district, was the last openly gay lawmaker in Utah. But Doughty, who lives in Salt Lake City with his partner, served on the board of directors of Equality Utah until recently, when he resigned to pursue the House District 30 seat. "I think it's important during these committee hearings and floor debates there's actually someone who can speak from the heart," said Doughty, before pausing to collect himself in the emotional moment. Biskupski said after the vote that she was pleased to see Doughty, her legislative district chairman, win the seat. She said it's good for both the lesbian, gay, bisexual and transgender (LGBT) community and the Mormon community to have an openly gay lawmaker at the Capitol. "I am excited that the LGBT community will have a voice again on the Hill because I've seen what a difference it makes to have someone on the floor who can articulate a personal message on some of the issues that arise, and that is really important, especially during this critical civil-rights time for the LGBT community," Biskupski said after Doughty's win. Doughty said his first priority in office will be to work with the redistricting process "and make sure the House District 30 does not totally disappear." "Sugar House and Liberty Park is really a community of common interest, and we don't want to split that up and have it absorbed by surrounding House districts," Doughty said. Brandie Balken, executive director of Equality Utah, which is nonpartisan, said Saturday afternoon she wasn't surprised to see delegates elect "two well-qualified, fair-minded candidates." "The LGBT community has worked very hard to create an infrastructure where their voices can be heard, and I think that this is a good demonstration of how it really is rewarding and it can be very productive to be involved in the political process," she said. In other results from the convention, Jim Judd beat Deb Henry for state party vice chairmanship, 363-242; Rob Miller defeated John Rendell for state party treasurer, 382-221; and Paul Pugmire topped Bob Henline for state party secretary, 389-214. As many as 1,200 people attended the convention Saturday, according to one party estimate.